Salted Caramel and Nutella Fronuts! 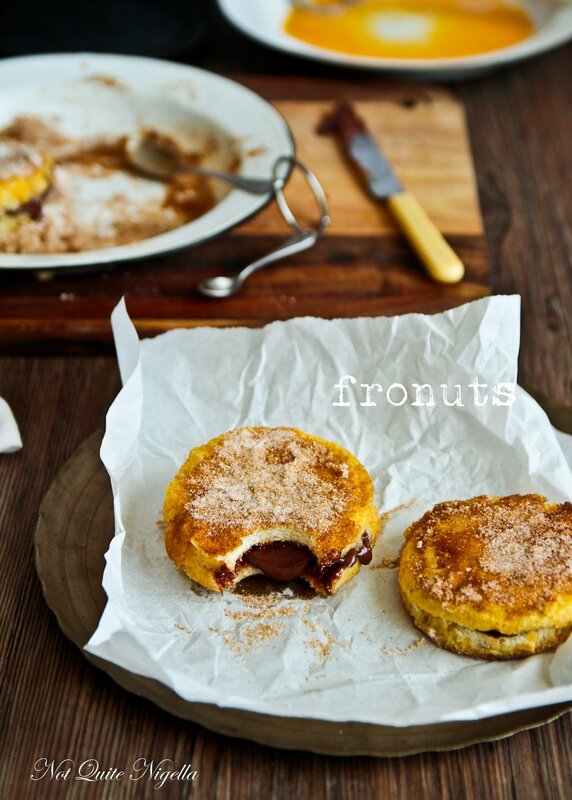 A fun weekend breakfast treat, a fronut is a cross between French Toast and donut. 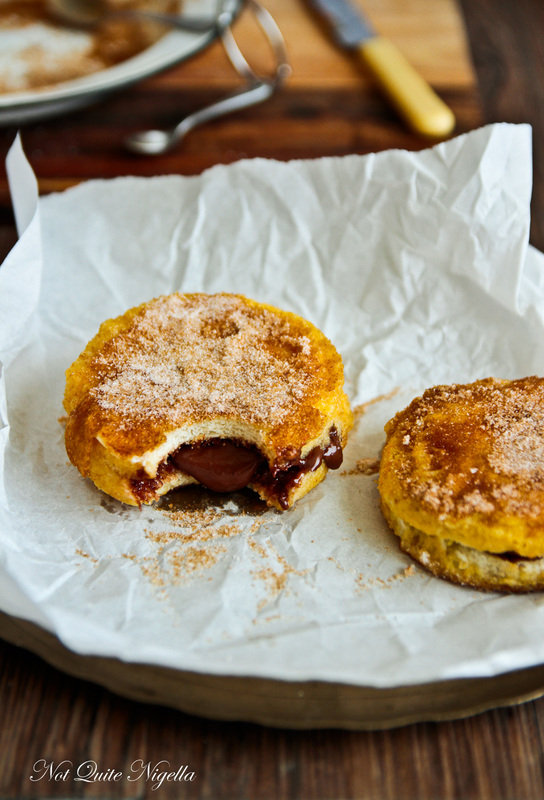 Filled with an unbeatable combination of Nutella and salted caramel sauce, the bread is the sealed at the edges and then dipped in beaten egg and then fried in a pan before it gets its final dredging in cinnamon sugar! Because I work from home by myself, I'm afraid that some rather odd behaviour often goes by unchecked. Talking to myself is a given and as the months and years go on, the crazy comes out a little more than it used to. I will suddenly get a line from a movie or tv show in my head and then have to yell it out and then resume working. Some might think that this is a version of Tourette's. And sometimes I forget when Mr NQN is home and yell out these things and look back to see him shaking his head saying, "Ahh Pickles...". That's my nickname you see. "It rubs the lotion on its skin..."
We waited around the phone, eyes wide with bated breath waiting for the response. A few seconds later it came through. "Haha! I get it, Silence of the Lambs!" he said showing that he may look a bit odd but he had a sense of humour and he knows movies. There's really nothing wrong with odd or weird really. In fact I think most odd or weird people are the most interesting to talk to. And there's nothing wrong with odd or weird food too. Take these Fronuts. I first saw them on Stephanie's blog The Dessert Spoon. 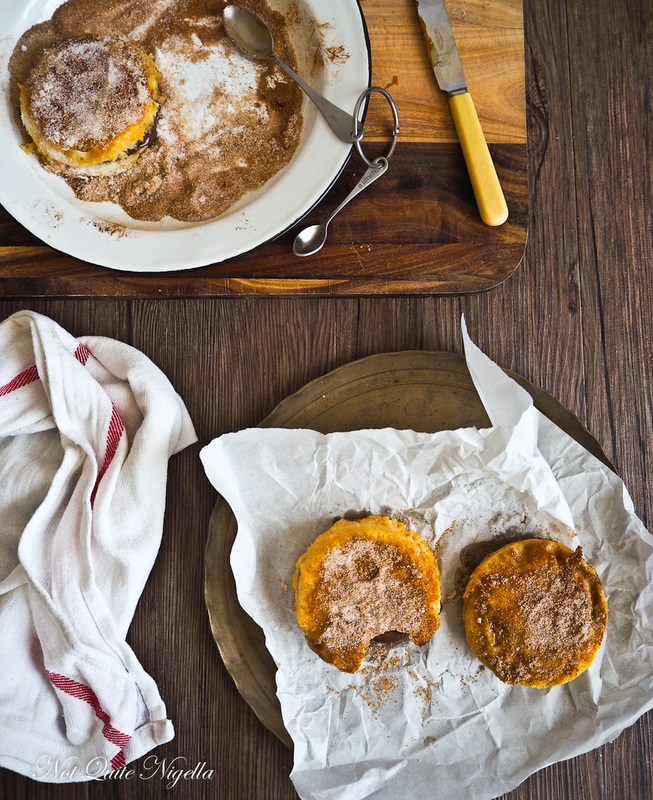 They're a cross between French toast and donuts. 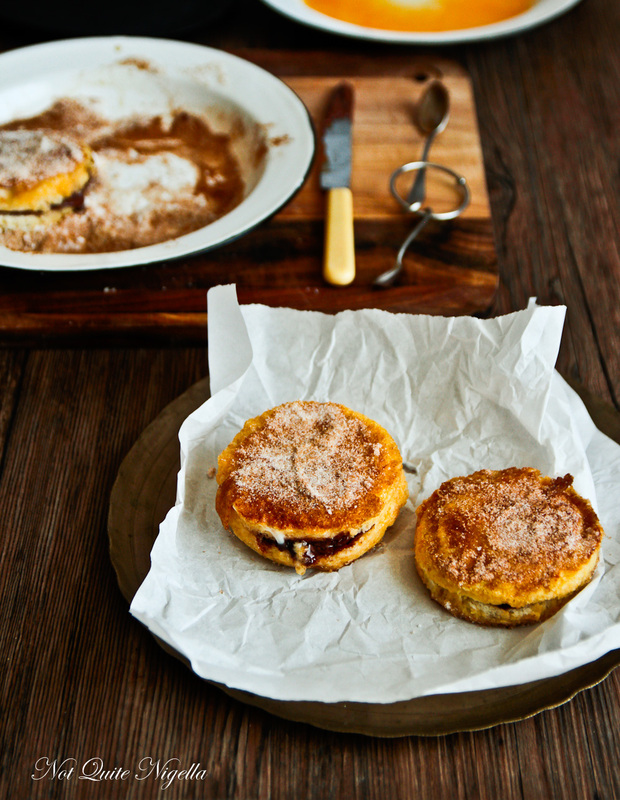 And they're incredibly delicious and easy to make. So tell me Dear Reader, do you talk to yourself? And did you know that line from Silence of the Lambs? Is there a movie or show or person that you often quote? 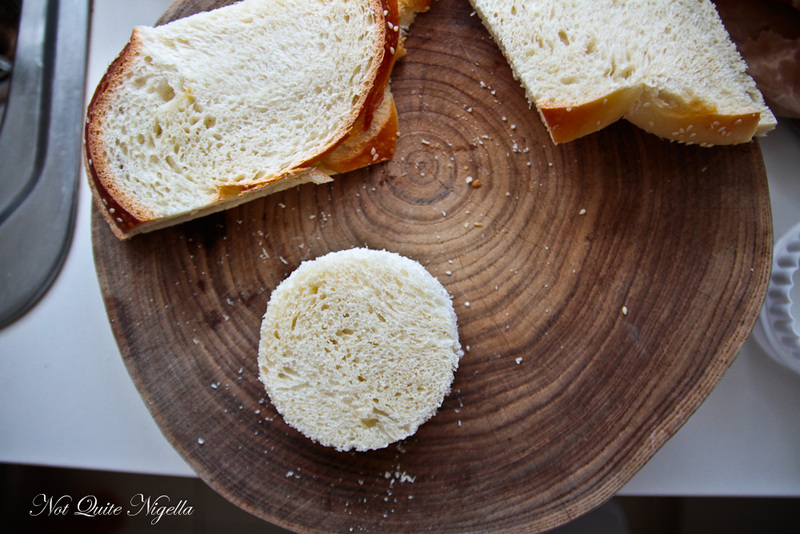 Step 1 - Cut out circles in the bread (you can also just cut the crusts off the bread slices). Spread four of the rounds of bread with 1 heaped teaspoon Nutella and 1/2 teaspoon of salted caramel in the centre. Press down on the sides to seal (it's ok if they don't seal exactly, just do your best as your mother might have said). Step 2 - Place the eggs in a shallow bowl and beat well. 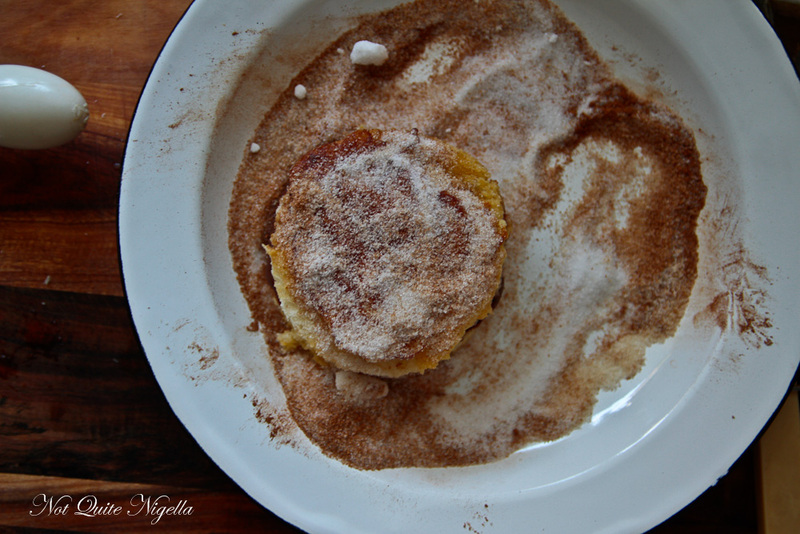 Place the sugar and cinnamon in another shallow bowl and mix together until combined. Step 3 - Heat pan and add the butter and melt. Dip the sandwiches into the egg mixture and then fry until golden. Turn over and fry on both sides. Dredge the sandwiches in the sugar and cinnamon mixture and serve immediately. 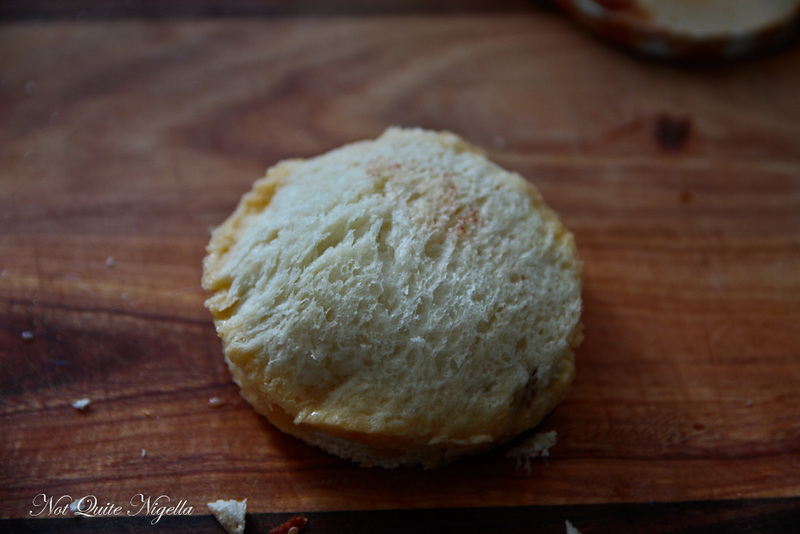 recipeGood Golly Great Green Grass Scones!